I had never read anything by Lynn Kurland prior to picking up Star of the Morning . I had never even heard of her before, due to the fact that she writes primarily historical romance and I just rarely find myself reading in that genre. But my eye caught on the cover as I walked through the romance aisle at Borders to get to the fantasy/scifi section. And something made me pause. It's always that dangerous pause that gets you, isn't it? If the book can just get a toehold on my attention, I'm so often a goner. I reach out, picked it up, and read the back and wondered. It's a fairly dreamy, idealized cover and not exactly my favorite. But I liked that it was just the girl and her sword. And when I saw the word "mercenary" on the back I just sort of knew I would like her. And perhaps she doesn't always wear flowing garments of blue. So I took it home with me and am so glad I did. Because this is an absolutely delightful series and one that deserves a wider readership. 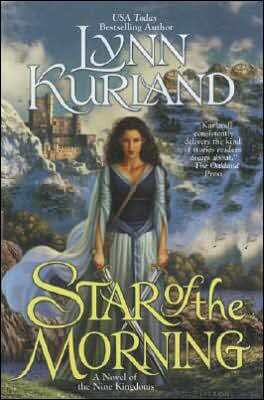 Star of the Morning is the first in the Nine Kingdoms trilogy. It was published just four years ago and both of the other two books are also out in paperback so now is really the perfect time to jump in and give it a shot. It's straight-up high fantasy, with a nice romance tucked in there and very deft, wonderful writing. Morgan of Melksham is not pleased. After putting in her time, serving years as an elite mercenary, she is reduced to messenger status. As a favor to her old friend and mentor Sir Nicholas, she agrees to deliver a sword of some note to the King of Neroche. Mystified as to why it should have anything to do with her, Morgan is somewhat mollified to be joined by a few of her longtime compatriots. To balance this out, however, she is also joined by an annoyingly pompous lad by the name of Adhemar and--shortly thereafter--by his somewhat less pompous younger brother Miach. Together, the assorted companions set out to see the blade safely to its rightful owner. And Morgan is forced to bite her tongue and see the job through, despite her lifelong hatred of all things magical and her legendary inability to suffer fools (such as Adhemar) gladly. Miach, on the other hand, becomes a friend. With his easy manner and utterly unrefined approach to life, he manages to make stoic Morgan smile, even laugh once or twice. And the journey seems somehow less taxing with him along. But their task becomes more urgent as they encounter various ominous portents along the way. Something--something dark--is seeping across the border into Neroche. And the only hope the king has is getting that sword into the hands of its destined wielder. If Morgan and her friends don't make it in time, all hell might literally break loose. The writing is what first made a favorable impression on me. It's honestly so light and sinuous that you don't even notice it. In the best way, it propels the story forward, never standing out garishly or halting along blandly. It allows the characters to stand out and shine. And they really do. Morgan is often frustrated and cranky at her present lot in life. Beautiful and ruthless, she has trouble dealing with those more frivolous and less dedicated than she is. But there is a history there as well. So many interesting questions as to how she ended up with the life that she did. Why she was raised by Sir Nicholas and why he sent her on this quest. It all amounts to the reader not really believing her gruff exterior and happily so. Then there is Miach. And Miach is perfectly delightful from top to bottom. If you don't like Miach, there might be something wrong with you. It is a pleasure watching him exasperatedly deal with his windbag brother at the same time as he plies sword-for-hire Morgan with jokes and compliments and attempts to get her to relax for one minute. This is a proper quest tale and, as I am a fan of such when they are well done, I loved going along for the ride. The characters are witty and up for anything and the world itself is twisty and turny and full of a long history of alternately dastardly and noble rulers. No one is exactly who they say they are, of course. And it all builds up to a very startling climax. Just when you think what you were hoping would happen will, in fact, happen--the threads of the tale are flung far and wide across the whole of the Nine Kingdoms and you are left gasping at the implications. I had to wait a year for the sequel. There was grumbling involved. But I will tell you that it was completely and utterly worth it, as The Mage's Daughter is a worthy successor in every way and sits contentedly on my Beloved Bookshelf. If you haven't run across this series before, I do hope you give it a try. It is a comfort read, uncomplicated but lovely, full of characters who will work their way into your affections. Highly recommended, particularly for fans of Sharon Shinn and Robin McKinley. Why I haven't read Princess of the Sword yet is beyond me! Morgan and Miach are just - how could you not like them? Everyone I've recommended this to has liked it and read the rest of the series. I was relieved I didn't have to wait a year for MAGE'S DAUGHTER! I can definitely understand your grumbling. Ah, I HAVE read this one!!! I think the book is definitely fantasy and the writing is light as you say. I also feel like you can tell author has a romance writing background somehow. I keep meaning to read the rest of the series. Thanks for the review!I had not heard of this book , but now would like to read it. I've read all of Lynn's books (I know her) and enjoyed them. I loved Star of the Morning, and The Mage's Daughter. Princess of the Sword is sitting on my nightstand, ready to be delved into. Oops! I've read the whole trilogy already - all three are great. She has a new one out of this same genre, another Nine Kingdoms book - A Tapestry of Spells. That is the one that is sitting on my nightstand. I like this idea! Is the picture on the button from the cover of a Mary Stewart Novel? I'm loving the Retro Friday posts this week. This has been slowly creeping its way up on my PBS wishlist. As of today, I think I have 8 weeks before it is offered to me. It just sounds like a wonderful story, and am so glad to hear that it actually is! And I still haven't read any Sharon Shinn and I've only ever read one book of Robin McKinley's (I know, I'm so behind). But this series definitely sounds like my cup of tea! Liza, I know! Me too. Manga Maniac, awesome. I look forward to hearing what you think of it. Holly, yes! It's the same here. Everyone I've given it to has loved it. What a happy statistic. Janice, definitely. I think you would like the 2nd one better. It's my favorite. misha, well, congrats on starting up your blog. I'll definitely be stopping by. Diana, how nice. And I keep meaning to go get TAPESTRY OF SPELLS! I can't believe it's been out this long and I haven't read it yet. heidenkind, yes, it is! It's from my paperback copy of MY BROTHER MICHAEL. A favorite. That's so funny - I seriously just added this to my TBR list a few days ago when someone else recommended it to me and now it's on hold at the library...yay! Looks like we enjoy the same type of books... I have just added 2 new ones to my TBR from your blog and I just got here! I absolutely love this series. I first heard of it because my best friend's husband's cousin is married to Lynn Kurland. Did that make sense? Anyway, thanks for putting this out there. More people definitely need to read it. And Miach....oooooooh!